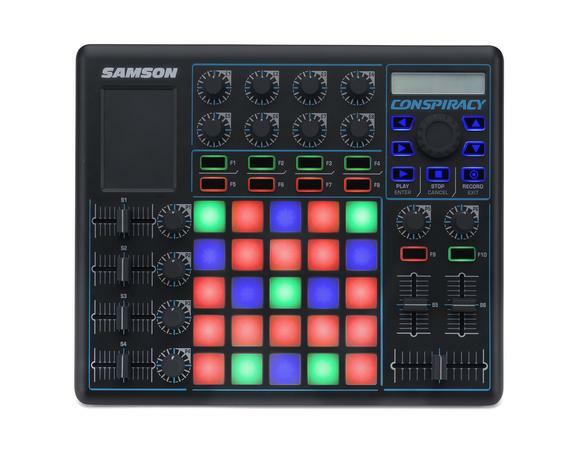 Samson's Conspiracy™ MIDI Control Surface lets you command your software with authority. 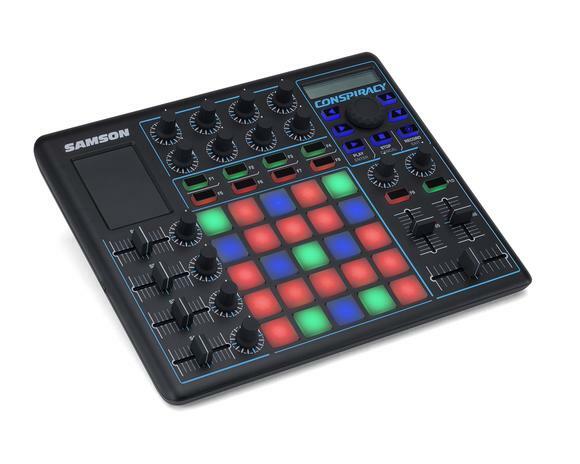 Featuring an ultra-portable design and impressive array of customizable, tactile controls, the Conspiracy™ is the answer for producers/DJs, performers and mobile musicians looking to expand their creativity in live and studio production settings. The core of the Conspiracy™ is made up of 25 velocity-sensitive trigger pads with aftertouch for sequencing melodies and rhythms, as well as launching clips, loops and samples for live performance. The pads also feature 3-color backlighting, which enables more comprehensive visual feedback and less reliance on a computer screen. Additional control is provided by the Conspiracy's 14 endless encoders, 10 backlit function buttons and 6 precision faders. All of these controls can be custom assigned via a backlit LCD navigated by a master encoder and four directional buttons. From here, you can program the type (Note/CC#), mode (Momentary/Toggle) and MIDI channel number of the pads, knobs, faders and buttons. Finally, the Conspiracy's X/Y touch pad is especially adept at manipulating effects or transitions within applicable software instruments. The Conspiracy™ is an ultra-versatile controller that works equally as well in the studio and on stage. In addition to its other controls, the Conspiracy™ features a 2-channel DJ mixer section with a cross-fader and dedicated transport buttons. 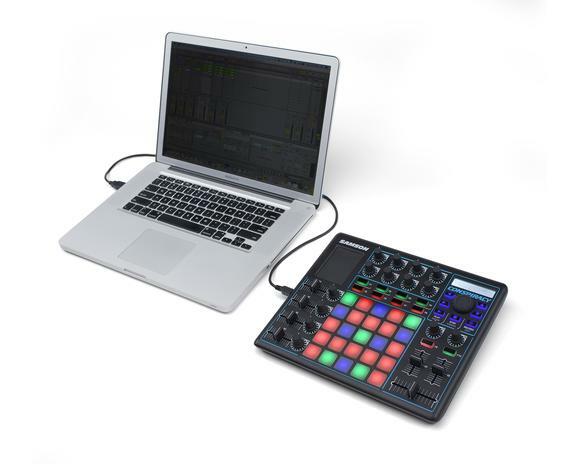 Its trigger pads and knobs are great for live remixing in applications such as Virtual DJ® and Traktor®, or dialing in effects and synth settings in Reason®, Ableton Live® and any of your favorite VST plug-ins. Also, 20 user presets allow you to quickly Save and Recall controller setups for different songs or recording/performance applications. With Samson’s Conspiracy™, feel the freedom of controlling your iPad or any computer-based audio application to its full potential.